The home of the Royal Astronomical Society since 1874 with recent refurbishment. Part of the extension to Burlington House to provide accommodation for learned societies. The Society’s apartments share the courtyard of Burlington House with the premises of four other learned societies: the Linnean Society of London, the Society of Antiquaries, the Royal Society of Chemistry and the Geological Society of London together with the Royal Academy of Arts. 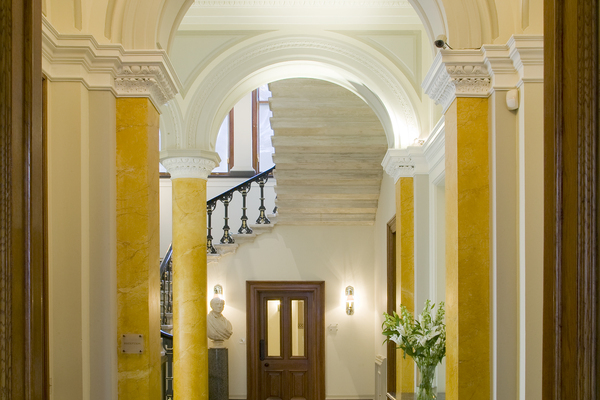 Leading on from the inner lobby is the building’s grand entrance hall, with a splendid staircase and a lift, with glass panels revealing striking astronomical images. In addition to the offices of the Executive Secretary and the reception is the lecture theatre and the Fellows Room. At the foot of the main staircase is a bust of founding member Francis Baily (by a sculptor called Baley! ), presented by Baily’s sister after he died in 1837. The Society moved into its present building in 1874. The premises were specially built by the government for the learned societies which were required to vacate Somerset House. Glass panels in the doorways were glazed with etched panes showing the logos of the various Societies. The ‘AS’ logo can be seen in the front doors and the doors to the Executive Secretary’s office. The Logo is repeated in the cast iron radiator panels in the main hallway, the Fellows Room and in the main library on the first floor. The Fellows Room, previously used as the Council Room, is a very comfortable room where Fellows can work, relax or meet. There is a slave plasma screen over the fireplace to relay meetings from the lecture theatre. The room is dominated by a painting entitled Celestial2 painted by Anthony Whishaw RA. It is acrylic on canvas and measures 66 x 90 inches. This room was originally the Meeting Room of the Society, but was partitioned in 1969, when it was divided up to make offices. The room has now been returned to its original purpose and the suspended ceiling which hid a fine moulded ceiling removed. The Council Room, which can seat 25 around the table, formerly housed the Society’s archives which are now in the basement. The staircase has been stripped of its 1960s blue and white paint and returned to its original black and highlighted with gold leaf to give a truly splendid effect. On the first floor landing is a newly commissioned window designed and produced by Sally Scott, in association with Nero Designs, made from 10mm thick white glass using acid, sandblast and colour. 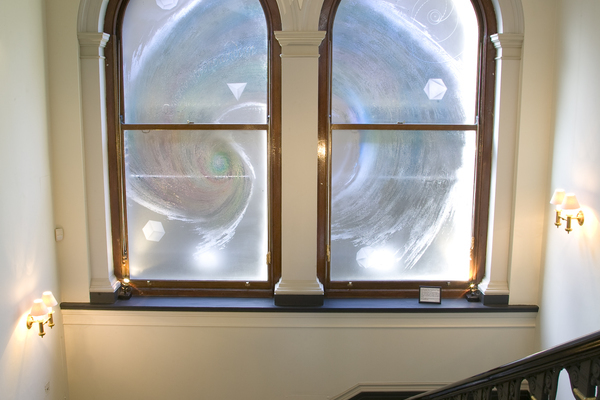 The window is an abstract interpretation of astronomy and geophysics. It shows a cosmic spiral, containing the motto of the Royal Astronomical Society, QUICQUID NITET NOTANDUM (Whatever shines should be observed). 2.73 (the temperature of the cosmic microwave background) and 223 (the number of lunar synodic months in a Saros cycle of eclipses). The 5 Platonic Solids are timeless symbols of the elements and the relationship of mathematics to the Universe. The elliptical orbits represent the Pioneer space probes to beyond the Solar System, as of 2007 – the farthest humankind has penetrated. 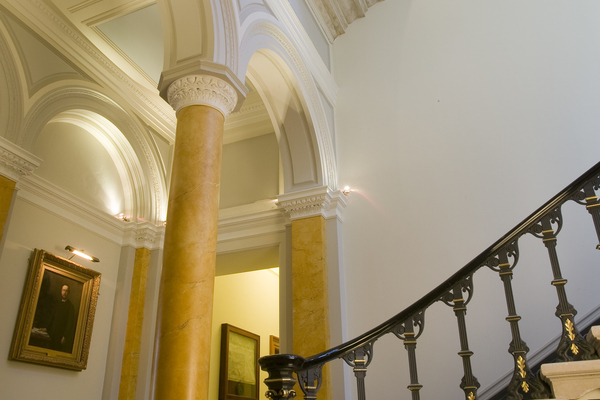 The first floor landing leads to the Society’s Library, the Grove Hills Room, and the Herschel Room, which houses the British Astronomical Association. Above the door to the Librarian’s office are portraits of the Reverend Lewis Evans, a great collector of instruments. To his right is a member of the Tully family of Islington who were famous instrument makers. Below are Sir William and Lady Huggins. William was an English amateur astronomer who built a private observatory at Tulse Hill in South London in 1856. He was a pioneer in spectroscopy and photography and together with the active collaboration of his wife, Margaret Huggins, played a part in developing the combined use of the telescope, spectroscope and the photographic negative. In 1899 they jointly prepared an Atlas of Representative Stellar Spectra. He was awarded the Royal Astronomical Society’s Gold Medal in 1967 and 1885 and was president of the Royal Society from 1900–1906. The Main Library houses the main collection of post-1850 books. It is used by Fellows, by visiting researchers consulting the archives and rare books collections, and for visits by astronomical societies, school children and other groups. It is used as a poster display area and networking space during the Society meetings which are held on the second Friday of the month. The exhibition cases contain an ever-changing display of highlights from the Society's collections. The large portrait dominating the Library is of Francis Baily, one of the founders of the Society and a four-time President. He is best remembered for Baily’s beads but was also important for laying the foundations of 19th-century astronomy by publishing a long series of star catalogues. These culminated in the British Association Catalogue, published after his death, which sorted out the positions of thousands of previously observed stars. He was a stockbroker who retired at 51 and devoted himself to astronomy.